An Crocodylus porosus in uska species han Crocodylia nga ginhulagway ni Schneider hadton 1801. An Crocodylus porosus in nahilalakip ha genus nga Crocodylus, ngan familia nga Crocodylidae. Ginklasipika han IUCN an species komo diri gud kababarak-an. Waray hini subspecies nga nakalista. 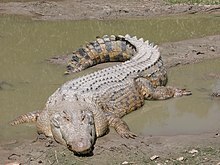 ↑ 1.0 1.1 "Crocodylus porosus". IUCN Red List of Threatened Species. Version 2012.2. International Union for Conservation of Nature. 1996. Ginkuhà 24/10/2012. ↑ Ross, Charles A. (1990) Crocodylus raninus S. Müller and Schlegel, a valid species of crocodile (Reptilia: Crocodylidae) from Borneo., Proc. Biol. Soc. Washington, 103 (4): 955-961. ↑ Cuvier, G. (1807) Sur les différentes especes de crocodiles vivans et sur leurs caracteres distinctifs., Ann. Natl. Mus. Hist. Nat. Paris 10: 8-86. ↑ 6.0 6.1 6.2 Schneider, JOHANN GOTTLOB (1801) Historiae Amphibiorum naturalis et literariae. Fasciculus secundus continens Crocodilos, Scincos, Chamaesauras, Boas. Pseudoboas, Elapes, Angues. Amphisbaenas et Caecilias., Frommani, Jena. 364 pp.